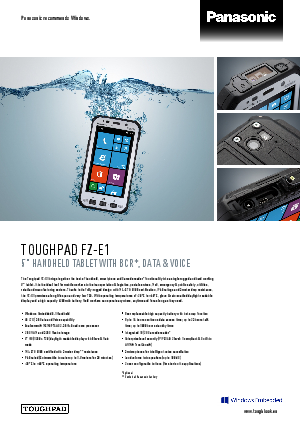 The Toughpad FZ-E1 brings together the best of handheld, smartphone and Barcode reader functionality into a single rugged and hard working 5" tablet. It is the ideal tool for mobile workers in the transportation & logistics, postal services, MoD, emergency & public safety, utilities, retail and manufacturing sectors. Download this factsheet to read about the benefits of the FZ-E1 and the impact that this can have on your workforce.